iPhone users browsing the web in Safari and via Google's iPhone app have reported something funny: Googling the word "tilt" makes your display appear off-kilter. It's just a slight tilt to the right, but it's surprising when you're expecting to see a regular Google results page. This does not seem to work on an iPad or on Google Android devices. So it seems like maybe this is an Apple easter egg, as opposed to something Google may have done. But I will try to confirm who planted this easter egg. 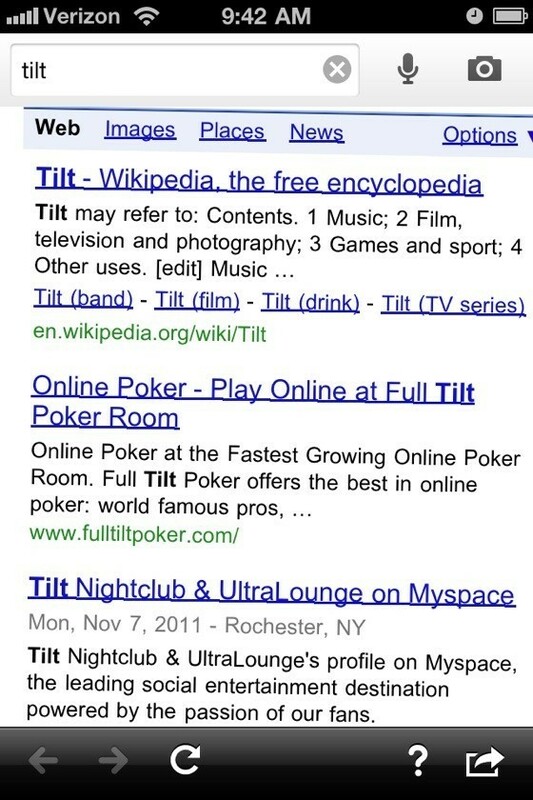 Have you recently tried searching "tilt" on Google using your iPhone? Did you notice your display go lopsided? Let us know in the comments--and also tell us if you've seen any other easter eggs--then have a look at a screenshot of the "tilt." Check out Google's recent April Fools' day pranks here.